In Sweden, Volvo has together with Bring delivery service been testing a new concept. They deliver your packages to your parked car, when the delivery person presses a button on a smartphone or tablet, Volvo unlocks the car via its On Call technology. Afterward the car relocks and sends the owner confirmation that the delivery is complete. Before the package is delivered you get a message asking if you will accept car delivery for this package. “Many people work or lead hectic lifestyles,” says Klas Bendrik, chief information officer at Volvo Car Group. “Deliveries to the car would save time and money.” Not to mention unnecessary stress and disappointment. Volvo also needs to hammer out details regarding safety and insurance. The service may not be workable in cities such as, say, New York, where leaving anything in your car could lead to a smashed window. In general, Bendrik notes that the service is better for low-value items such as food or even dry cleaning. “Safety has always been a big concern at Volvo,” he says. 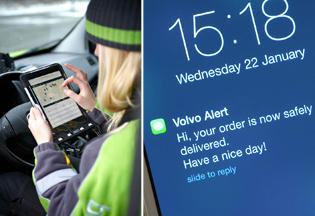 GOTHENBURG and BARCELONA, 20th February, 2014 /PRNewswire/— In a ground-breaking technology move for the automotive industry, Volvo Cars demonstrates the world’s first delivery of food to the car – a new form of ‘roam delivery’ services. The service, which will be showcased at the Mobile World Congress, will allow consumers to have their shopping delivered straight to their car, no matter where they are. Volvo’s new digital keys technology will allow consumers to choose their car as a delivery option when ordering goods online. Via a smartphone or tablet, the owner will be informed when a delivery requires dropping off or picking up from the car. Having accepted the delivery, a digital key will be activated which tracks when the car is opened and then locked again. Once the delivery is completed, the digital key ceases to exist. The system is based on the functionality of the telematics app Volvo On Call, which also makes it possible to remotely heat or cool the car and see its position or fuel level via the mobile phone. Earlier this year Volvo Cars launched Sensus Connect, an integrated on board navigation and infotainment experience. Volvo Cars’ strategic partnership with Ericsson builds further on the idea of the Networked Society by examining a host of consumer centric concepts around the “Connected Vehicle Cloud” that sees the driving experience revolutionized over the coming years. ‘Roam delivery’ is one example where Volvo Cars explores the potential of connected cars to create solutions which will simplify the customers’ everyday lives. The pilot programme has also revealed 92% of people found it more convenient to receive deliveries to their car than at home. “By turning the car into a pickup and drop-off zone through using digital keys, it’s now possible to deliver the goods to persons and not just places. The test-customers also indicated that the service clearly saved time. And the same thing is valid for delivery companies as well! Because failed first-time deliveries cost the industry an estimated €1billion in re-delivering costs.4 We are now further investigating the technology of digital keys and new consumer benefits linked to it,” says Klas Bendrik, Group CIO at Volvo Car Group. Next: The Samsung Galaxy S5: Bigger Is Better?